Delicious! I was nervous because the batter wasn't all to tasty, but I guess anything dunked in butter and rolled in cinnamon and sugar would taste good! I have actually made them twice now since Joe complained I didn't save any for him the first time! For the first couple I dunked the whole muffin in the melted butter, but that seemed to soak up a little too much so I started just brushing it on and it worked better. And, of course, I dunked the whole muffin, not just the top. Preheat oven to 350 degrees. Butter and flour 12 standard muffin cups. In a small bowl, whisk together the pumpkin and buttermilk. Set aside. Using an electric mixer, cream the butter and brown sugar. Add the eggs, one at a time, scraping bowl as needed. With the mixer on low, add flour mixture in three additions, alternating with two additions pumpkin mixture, and beat to combine. 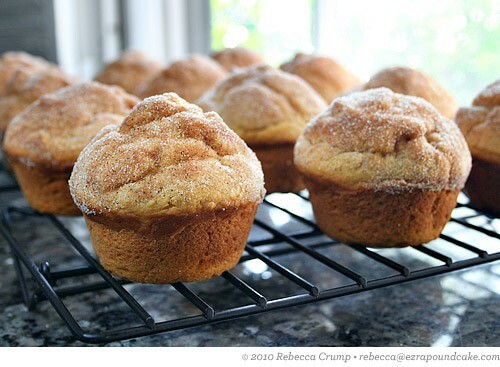 Spoon 1/3 cup batter into each muffin cup. Bake for 30 minutes. Let muffins cool 10 minutes in pan on a wire rack. Working with one at a time, remove muffins from pan, brush all over with melted unsalted butter, then toss to coat in sugar mixture. Let muffins cool completely on a wire rack. Store in an airtight container, up to 1 day. FREEZING: The naked muffins can be frozen for up to 3 months. Reheat in a 350 degree oven, then coat in butter and sugar. Hopefully Shannon and I free up some time to get posts up a bit more regularly. Anyone have any pumpkin recipes for us to try?